Get the preppy look for an un-preppy price...I was out shopping with some friends yesterday and we stopped into Sears to take a look at Canvas by Land's End. I'm not ashamed to say that I have a down coat for those chilly Northeast winters from Canvas's parent Land's End that was a quarter of what a higher end coat would have cost me. I usually stock up on staples like tees and cardigans to save a little money for higher prices skirts, dresses, and jeans. On my recent visit I was pleasantly surprised to find several skirts and dresses that I would consider adding to my summer wardrobe. I can see running around on Saturday doing errands or grabbing brunch in the chambray shirtdress, I'd probably wear different shoes though so the darn cobblestone streets don't cause me to break my ankle. I love this gorgeous yellow floral skirt - lunch meeting anyone? 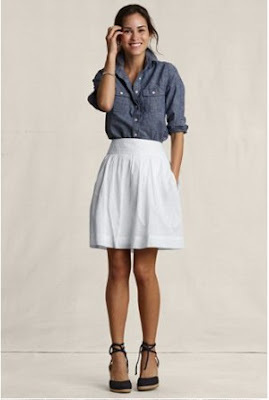 I'm digging the combo of unstructured chambray shirt and flowing, feminine white skirt. And the madras skirt and sweater is perfect for an early summer boating trip over from the Cape to Martha's Vineyard or Nantucket for the day. Bright tank and white chino skirt = lunch and then let's hit the beach. The orange and tan linen skirt is a fun pop of color for the summer!